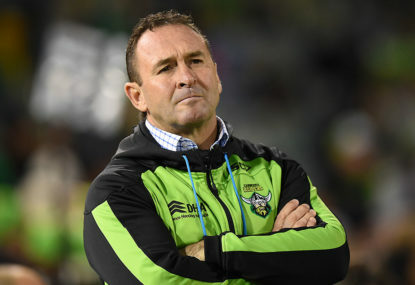 Raiders coach Ricky Stuart lashed the league following the match, suggesting match officials’ decisions were being clouded by mixed messages and too many outside influences. Frustrated by the drama surrounding Friday night’s loss, Stuart claimed he knew of people who had stopped watching the game through the league’s highly-publicised crackdown this year. He was also incensed by an email sent to club coaches this week warning players would be penalised if they continue to slow down the ruck. “I believe we have very competent referees. And I think the training they do an preparation to get into a game is as good as it can be,” Stuart said. “We have too much noise, too many people around them not letting them doing their job. “We’ve ruined the first 14 rounds of the competition, we’ve lost fans and I know people who have turned off because of it. “But then halfway through the year (NRL chief executive) Todd (Greenberg) comes out and says I’ve told the referees to stop nitpicking. Friday’s drama came in the 58th minute when after the Raiders reduced a 16-point half-time deficit to four, the Sharks hit back through a vital try after touch judge Rick MacFarlane raised his flag following a possible knock-on. Referee Gerard Sutton also put his whistle to his mouth as the Raiders defenders stopped, but Sharks winger Sione Katoa was allowed to cross before the bunker ruled there was no knock-on in the lead up. The NRL admitted afterwards the touch judge should not have raised his flag during the play as no-one went over the sideline, and a review of whether there was a knock-on would take place. “It wasn’t out. The touchie shouldn’t have put his flag up,” an NRL spokesman said. Regardless, Canberra are now six points out of the top eight and have the most difficult run home in the competition. Stuart refused to blame his team’s predicament on the decision, but still questioned the issue. “I just criticised my players in there for not playing the whistle. Then they tell me the flag went up and the referee called knock on. So what are they meant to do?” Stuart said. Stuart was also frustrated by a tough forward pass call against Joey Leilua which denied the Raiders a try with 10 minutes to go, as they attempted to mount a comeback.